FREE ON AMAZON, JANUARY 24 and 25, 2019! Summer stock can be murder, as young actor John Winkle finds out when he joins the fledgling Bass Harbor Players. It wasn’t enough that the local scribe was killing them with his gleefully poisonous reviews – someone took it a step further and murdered their loathsome leading man. Recruited by resident character actress Peach Varringo to help solve the crime, John finds himself in the unexpected role of “detective,” improvising an investigation that turns deadly – he soon learns that he is surrounded by a cast of suspects who had too many reasons and too many opportunities to kill. As stormy skies open up over Cape Cod, John and Peach are on a deadline to uncover a killer. 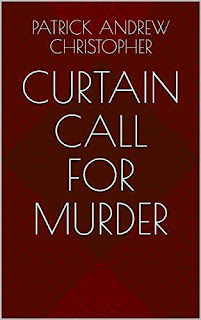 One missed cue could mean … a curtain call for murder!